A healthy appetizer with farm cheese and vegetables. It also looks very nice on a holiday table! It took a bumpy ride all the way from Ukraine to America, and its worth a try! Ingredients: 1.) Wash and dry vegetables, cook eggs, beats and carrots. 2.) Divide the farm cheese into three different bowls equally. 3.) Shred carrots, beats and eggs into separate piles. 4.) 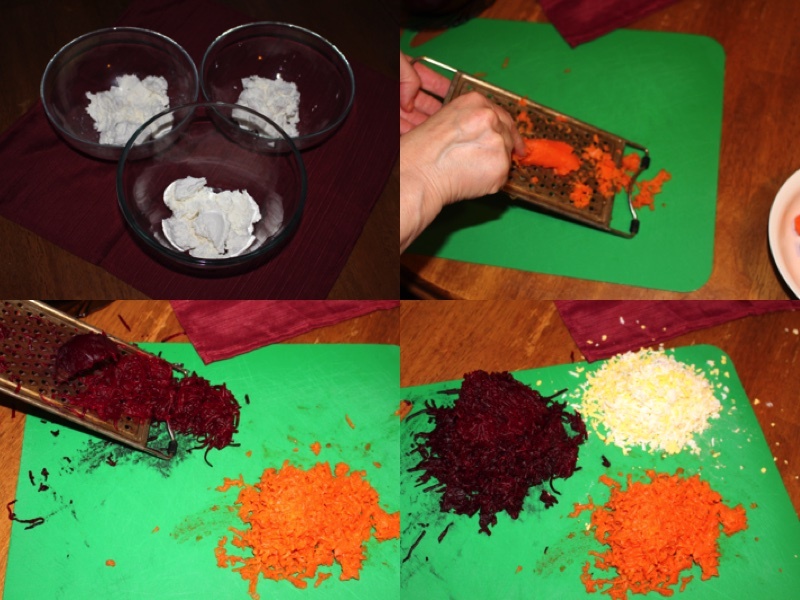 Place each pile into one of the 3 bowls you should have each bowl with only one of the 3 (carrots, eggs and beets). 5.) Divide mayo into the 3 bowls equally. 6.) Add salt, crushed garlic and pepper to each of the 3 bowls. Mix each bowl well. 7.) Set up the serving dish with branches of parsley. 8.) Divide 6 wall nuts and 6 Prunes in half to make 12. 9.) With 2 spoons and the egg mixture on either side, place a wall nut inside it and press them together. 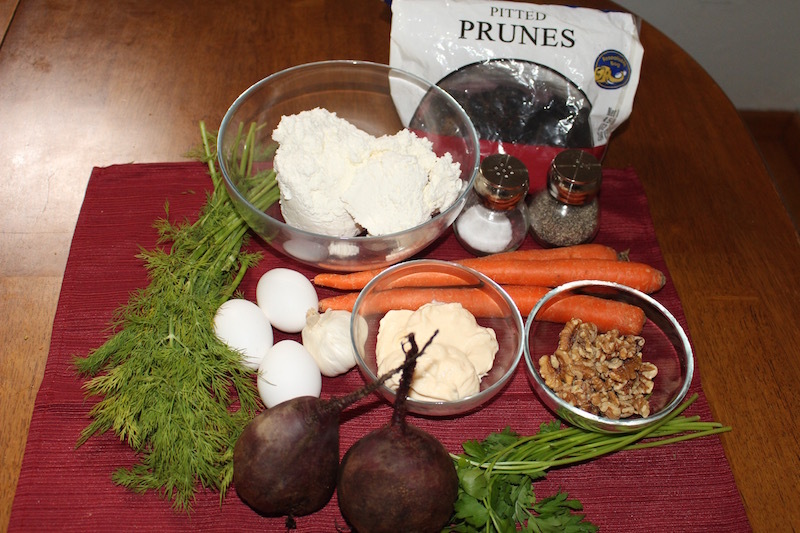 Do this to the beets mixture with prunes and to the carrot mixture. 10.) 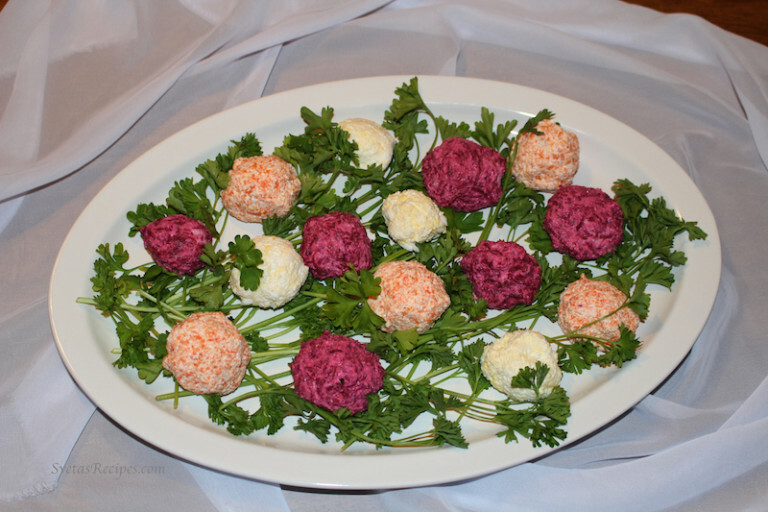 Place the spheres on the serving dish and enjoy! Wash and dry vegetables, cook eggs, beats and carrots. Divide the farm cheese into three different bowls equally. Shred carrots, beats and eggs into separate piles. 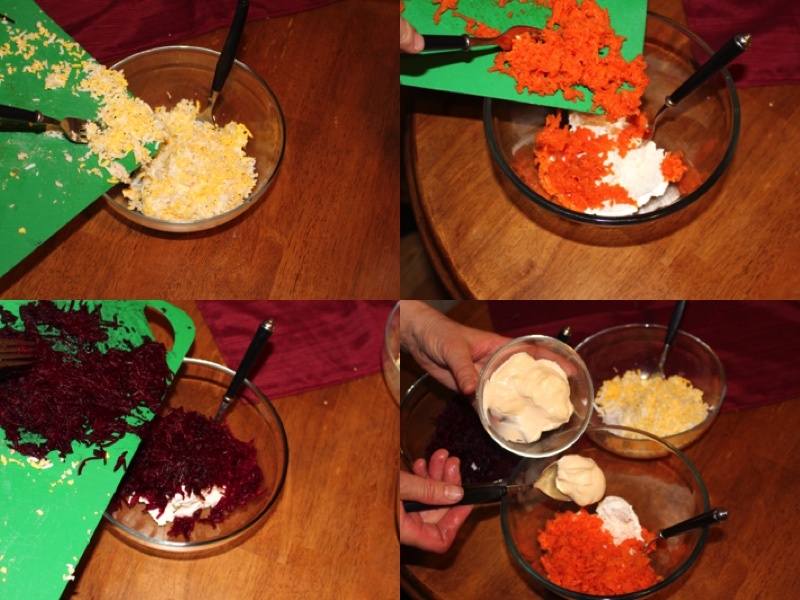 Place each pile into one of the 3 bowls you should have each bowl with only one of the 3 (carrots, eggs and beets). Divide mayo into the 3 bowls equally. Add salt, crushed garlic and pepper to each of the 3 bowls. Mix each bowl well. 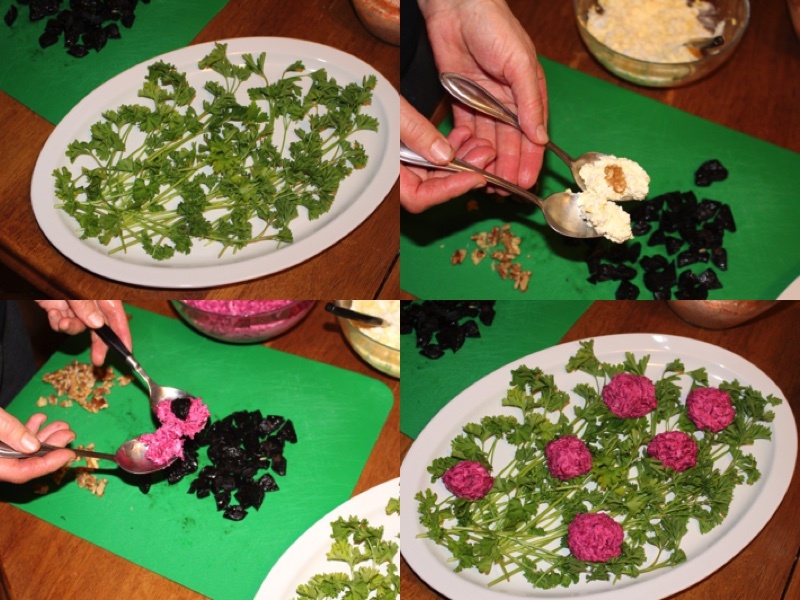 Set up the serving dish with branches of parsley. Divide 6 wall nuts and 6 Prunes in half to make 12. With 2 spoons and the egg mixture on either side, place a wall nut inside it and press them together. 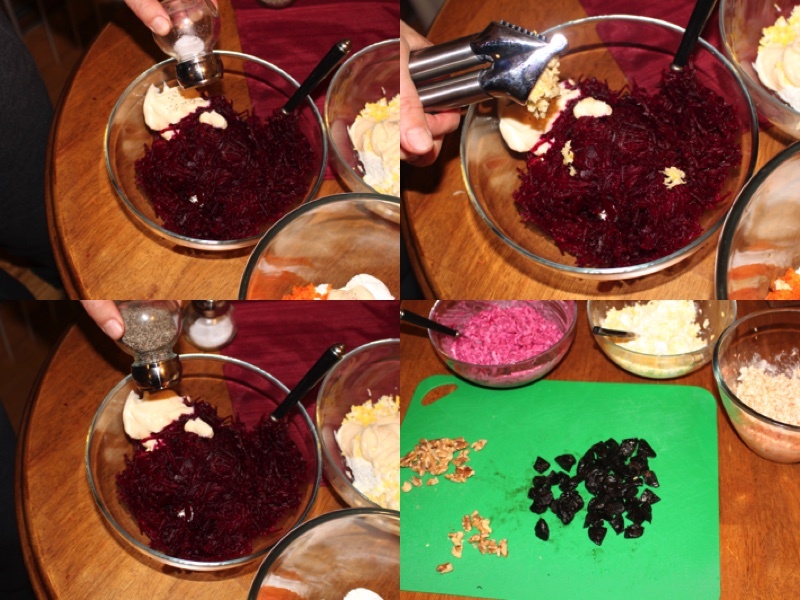 Do this to the beets mixture with prunes and to the carrot mixture. Place the spheres on the serving dish and enjoy! wow.. thanks for sharing.. boll with prune and walnut is my favorite salad… I always buying from our Philadelphia Russian Store but could not duplicate it. Thanks for sharing..